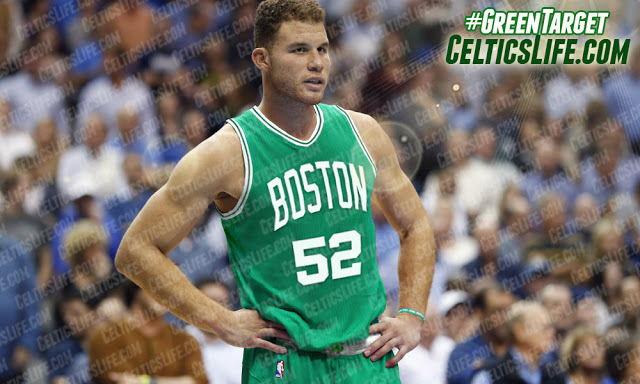 "Boston is really the danger for Blake Griffin," said Wojnarowski. "I think Boston's two primary free agent targets, right now, are Gordon Hayward and Blake Griffin. Now they're not going to get both of them, but they're both players that would potentially have interest there. I think Boston looks at in different ways with their future." Griffin also is said to have noticed the way Boston embraced Paul Pierce during his final visit. I'd be surprised if Griffin left Los Angeles. He's comfortable there and the Clippers can pay him the most. But when Adrian Wojnarowski posts a rumor of a top free agent considering Boston you have to take notice. While Griffin would have been a fantastic addition years ago, I'm not sure if you can really commit two max contracts to two big men (Griffin and Horford) in today's NBA. You rarely ever saw two bigs on the floor for either the Warriors or Cavs in the Finals. Sometimes there were none as Durant and LeBron were the biggest players on the court. Just a different NBA today where you're best off with only one big man on the floor. Gordon Hayward should be the main target in free agency. He's still young, durable, gives us another go-to guy on the perimeter and would fit in perfectly with his former coach's offense. Griffin would be a solid back-up plan if Hayward turns us down. I actually think if you're going to play two bigs Griffin and Horford could work better together than most pairs. Just not sure it's worth paying the two $60 million a year, considering Horford's age and Griffin's injuries. The Celtics can't really trade Horford, at least not yet, as it would be a bad look after he agreed to sign with us last summer. I guess you could always see how the team fared with the two big men and then make a decision a year from now. Again the most likely scenario is that Blake Griffin takes the extra cash and year and stays in L.A.